Loretta Lynch Sworn In As U.S. Attorney General : The Two-Way Lynch's nomination was confirmed last week by the U.S. Senate, five months after President Obama nominated her to succeed Eric Holder. Loretta Lynch is the new U.S. attorney general. Lynch was sworn in today by Vice President Joe Biden, who said the daughter of a Baptist minister who preached during the sit-ins in Greensboro, N.C., will now be "leading the march to a more perfect union." 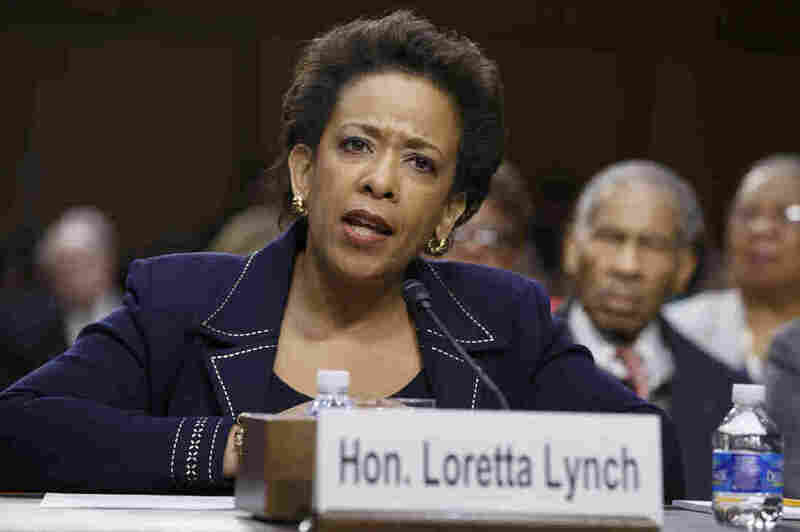 Lynch, 55, is the nation's 83rd attorney general and the first black woman to hold the position. She said during a ceremony at the Justice Department that she would work to "imbue our criminal justice system with both strength and fairness" to protect the rights of all. "The nomination has been embroiled in a partisan fight between the Obama administration and Republican lawmakers opposed to the president's executive actions to limit deportations for millions of illegal immigrants. Republicans were angered by Lynch's support of the president's stance on the controversial issue." Previously, Lynch was the U.S. attorney for the Eastern District of New York. You can read more about her background here.